How is your method of surgery different from other hospitals specializing in hernia repair? In almost all cases we use your natural nearby nearby muscular tissue, and not a piece of synthetic plastic mesh to hold back your hernia. As a result your body has an easier time recovering from the repair without complication. Mesh repairs are more prone to complication; the most common of which is chronic pain (pain after surgery lasting for more than 6 months) and recurrence (your hernia returning). Low complication rates: For the last 1230 tissue hernia repair cases over 2.5 years there has been no recurrences (0%); one case of chronic pain (0.0008%); 2 patients with bleeding complications (1 requiring surgery); 1 possible infection. (Ansa Health Care statistics). Aren't the latest techniques better? In an unspecialized surgeons hands - yes. Non-hernia surgeons who do very few hernias a month are best suited to doing implantation of mesh and fixing it to your tissues the easiest way possible. Surgeons who use the Shouldice technique are highly trained and specialize in doing hernia repairs. With a tissue hernia repair specialized surgeon doing your repairs the answer would be – No, our technique is the best and safest technique with the lowest recurrence and chonic pain complication rates compared to other methods. We use the best surgical techniques. True, bruising is relatively harmless and in most cases resolves without problem. We prefer to be safer at every opportunity. We use electrosurgical cautery (a device to seal blood vessels). This minimizes bleeding resulting in less trauma to the surrounding tissues. We, as best as possible, try to prevent this. Our surgeons uses this routinely. This also limits the risk for infection by preventing blood clots (within which bacteria can multiply) in deeper tissues. This is what can happen when cautery is not used routinely. Less post operative pain: With our procedure there is no requirement for painful skin clip removal over multiple days after surgery. 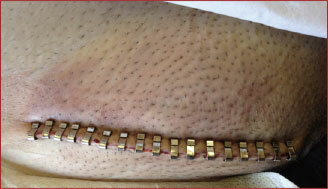 We take the time to properly and securely close the wound at the end of surgery. Wounds that are not secured for long enough with suture underneath the skin have a chance of coming apart requiring another often painful procedure to close securely. Skin Clips : This is an example of skin clips. They are sometimes painful. to remove. There is no good reason to use skin clip to hold the skin together after your surgery because there are very safe more effective and time tested stronger ways using dissolving sutures keeping the skin together after surgery. There is no requirement for your incision to be monitored for several days in hospital with its added cost. You will be cared for by your own dedicated hernia surgeon and specially trained nurse. You will not have a rotating group of surgeons and nurses caring for tens of patients in assembly line fashion with an emphasis on speed. Your care will be tailored to your needs. There is no requirement for you to be cared for by your fellow patients, or submit you to massage etc.. We believe that this has no place in the modern treatment of hernias. We subscribe, as best as possible, to evidence based surgery where there is good scientific study to support our practice or at least follow sound surgical principles. You are taken care of, from beginning to end, by a single, dedicated surgical team made up of your surgeon, anaesthetist, nurse and support staff throughout your stay. You are not cared for an indifferent group of caregivers. What about the whole tension and tension free repair issue? Isn't it better to repair without tension? Yes and No. Yes. generally tissues heal best under no tension. We create some slight tension in order to effectively block the hernia. However, this must be weighed against the risks of using artificial polypropylene mesh. In the case of mesh repair, it is possible to repair without tension but you increase the risk of reccurence markedly by using polypropylene (plastic), a relatively inflexible substance that results in significant shrinkage over time. This, in and of itself, puts the strength of the repair at risk. Contraction of this plastic over time may trap nearby nerves and other structures causing recurrence or chronic pain. The muscles that we use and move into position for groin repair, move only are small distance and are not placed under significant tension (link to article on Shouldice repair and tension). Why is it important to have a well-qualified board certified surgeon? Having your surgeon who is trained, not just repair of your hernia, but one who is well trained and experienced in all types of general surgery is important. When things go well, as is generally the case, any competent surgeon can deal with familiar surgical conditions well. Board Certification gives you comfort, in the unlikely event that there are complications, say, injury to the big blood vessels in the area, your surgeon has been trained to deal with it. All our surgeons are American Board Certified and re-certified surgeons. They have been trained to deal with this type of surgical repair including unusual surgical complications. Competence is assured. Isn't it better to go to a high volume center where each surgeons does as many as possible operations in one day? High volume usually means there is emphasis on speed. Speedy operations are never a good idea. There must be no financial or other incentive to be speedy. A speedy surgery is very rarely good surgery. If your surgeon is doing 6 or 7 operations in one day and you are number 7 and he or she had a tough 2nd case, what are the chances that is he going to do a good job on your case especially if you are number 7 on the list of operations for that day? At Ansa Health Care, we limit the number of cases to 5 or 6 per day. This gives your Ansa Health Care team adequate rest between cases and perform their best for Everyone. Our team is dedicated to providing you with the best care possible to get you through your procedure. You are our top priority. NOTE: We will contact you to confirm the booking date & time. You can use this form for general inquiries as well.